When Residence bar and restaurant opened in Nantwich 2007, it was Dawnvale that carried out the fit out. 10 years later, and we were invited back to help transform this beautiful venue once more, extending the dining areas, increasing capacity, and attracting new clientèle. We refurbished Residence in line with a stunning design brief by Paul Danson Imagineering, converting the exterior courtyard into a new, family-friendly restaurant extension. The project required a full bar and restaurant fit out, plus extensive structural work, all to be completed in just six weeks. We carried out structural work to tight deadlines, refurbishing Residence, and building the new extension in just six weeks. This included flooring, ceilings, electrics, and the full fit out. We constructed the new restaurant extension out of the old exterior courtyard. We raised the floor by 1200mm, and constructed new walls, and a new roof structure with decorative beams. Residence is set in a mansion that dates back to the 1600s. The work carried out and the finishes chosen had to remain sympathetic to this beautiful building’s character. Residence’s floor plan was redesigned to maximise covers and operational flow, retaining the cosy feel and intimate spaces for couples, while accommodating new family clientèle. 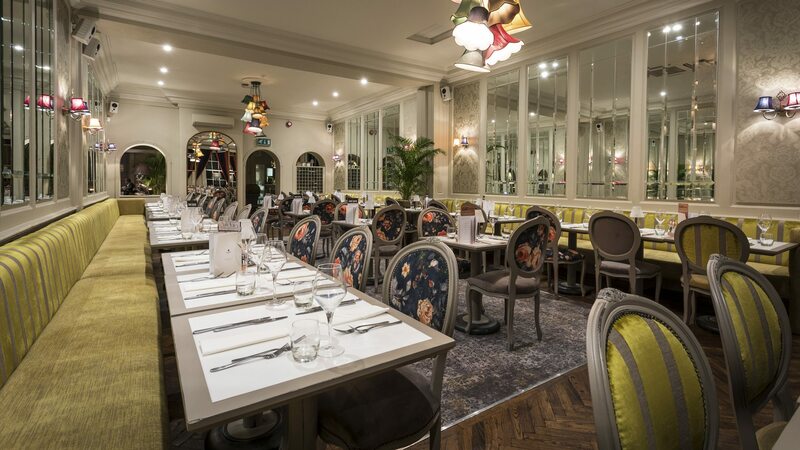 The new Residence has a full range of Dawnvale restaurant furniture, including fixed and booth seating, and Elizabeth bar stools and side chairs, with eye-catching bespoke upholstery. An authentic wood-burning pizza oven was installed in the newly converted courtyard, offering both a new range of family-friendly meal options and a visually exciting touch to the restaurant. We installed a new L-shaped bar, with a stainless steel commercial bar frame, mink faux leather frontage and sleek white Corian counter. We also installed brand new booth seating. As part of this project, we carried out a value-engineered commercial kitchen and bar fit out, streamlining these areas to increase the speed and ease of service. Dawnvale did Residence's original design and fit out some 10 years ago, and the company's level of expertise has just increased since then. Their industry operational knowledge makes a huge difference to how we built this new space, and to how it works for our business. I wouldn't build another restaurant without Dawnvale's help. 'Proactive, professional and knowledgeable' - that's how I'd sum Dawnvale up.